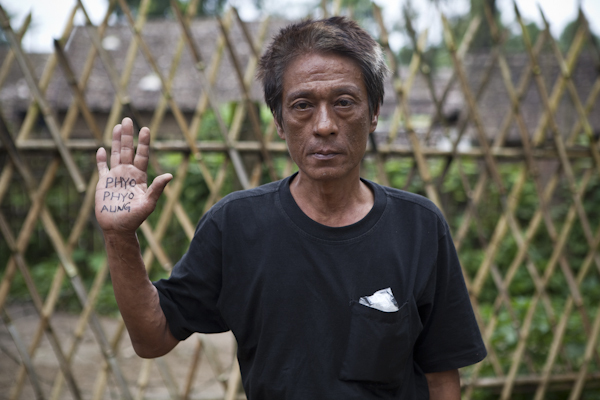 Burma’s non-violent revolution has seen thousands detained for their political activities. 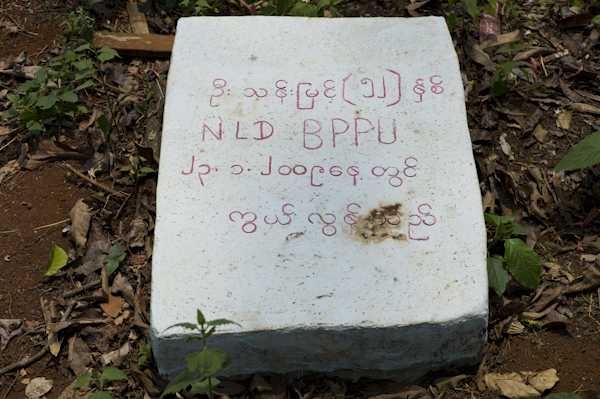 There are currently more than 2,100 political prisoners in Burma’s notorious jails. From the refugee camps and safe houses on the Thai-Burma border to those who have been resettled to third countries around the world, ‘The Prison Without Bars’ (an ongoing long term documentary project) follows the lives of Burma’s former political prisoners as they continue in the struggle to bring democracy to Burma as well as their own personal fight for freedom. Soe Lwin was arrested for handing out democracy pamphlets aged just 14. He was sentenced to 29 years in prison and served more than 15 years behind bars. 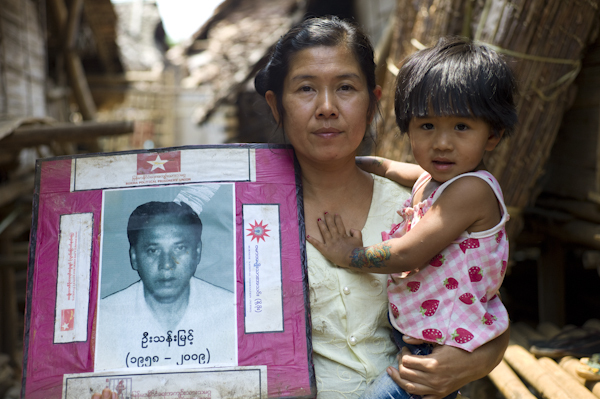 Khun Saing spent more than 13 years in prison. An issue that we have been working on for some time with the former political prisoners living in Mae Sot and the refugee camps along the Thai-Burma border is now being accelerated as the date for the elections has been announced, bringing with it the very real threat of the former political prisoners being returned to Burma. You can read previous posts here and here. The Ex-Political Prisoners of Burma have joined together in an unprecedented call for help from the international community ahead of the elections in Burma set to be held on November 7. The Ex-Political Prisoners, now living in camps on the Thai Burma border, fear forced repatriation from Thailand to Burma after the election and are desperately seeking assistance that is currently unavailable from the UNHCR for a safe haven, if only temporary, in a third country. The Ex-Political Prisoners currently have limited access to UNHCR to claim refugee status due to policy agreements between UNHCR and the Royal Thai Government. The fear is that the Thai Government could repatriate all refugees back to Burma after the November 7 elections on the basis that the elections have created a legitimate Government in Burma. The Ex-Political Prisoners claim that the election will be a sham. Many potential candidates have been banned and Aung San Suu Kyi remains under house arrest. The elections will change nothing, they claim, but simply install the junta under false pretences for a number of years to come. During this period any repatriated ex-political prisoners fear that the Junta will again persecute them. “There are multiple examples of forced repatriation from Thailand, a violation of the Principle of Non-Refoulement which is a cornerstone of International Human Rights Law. The Royal Thai Government has clearly stated its intention of repatriating Burmese asylum seekers following the ‘democratic election’ in Burma. Our fears are well founded and should we be forced to return, with no recognition from UNHCR, we face certain imprisonment or death,” the ex political prisoners said in a signed letter to human rights organizations around the world. NOTE TO THE EDITOR: We plead for your help. Please publish the attached letter or an article exploring our situation so that the general public is aware of the situation we face. Without help from the international community we have no further options. We have sent this letter to a number of Human Rights Lawyers and Human Rights Organizations in the hope of gaining legal representation. Should you have any further questions please do not hesitate to contact our spokesperson Aye Min Soe , also an Ex-Political Prisoner, at andrewsaisai@gmail.com (ph +66822259968). Yesterday was another day off as slowly the wheels start to get back in motion for a potentially hectic few days before leaving Thailand next Thursday. But that may now be in serious doubt as an earthquake has erupted in Iceland and it’s closed all airspace over Europe in the past few days meaning no flights from anywhere in the world. Looks like I might be here for a bit longer yet… no complaints form me, but there’ll be plenty from others I’m sure! Can’t do anything until tomorrow anyway as we are back off to Umpiem Mai camp today to photograph a few of those former political prisoners who weren’t available when we were there a couple of weeks ago. We miss the first line car as it leaves 30 minutes early so an unfortunate delay means we get down to Umpiem with even less time now than we had hoped – it’s only a one day trip so time is tight. Again unfortunately none of the Karen former political prisoners are available as they are not in the camp. It’s a real disappointment as it’s equally as important to show the wide ranging scale of political prisoners across all ethnicities in Burma. No matter though as we make our way back up the hill to Section 16 – I’m pretty sure I could do this trip blindfolded now. Again a warm welcome and its great to see everyone again. It’s a really hot day today and bright sunshine meaning photographing people isn’t easy but we only have 3 people today but again we have to find locations in this small area that we haven’t used before… some serious artistic license required! Today we photographed the above 3 former political prisoners in Umpiem camp: Zaw Moe Myint was arrested after student demonstrations at Hleddan junction in 1998 and spent 4 years in prison. Tint Lwin @ Thein Gi Aung was arrested in 1990 and spent 8 years in prison. He fled after being involved in the Saffron Revolution in 2007 and after MI arrested him in 2009 in regards to action against the election in 2010. Naing Min Htwe was involved in student demonstrations in 1996 and spent 6 years in jail. He fled in 2009 at the time of Aung San Suu Kyi’s trial after a threat of arrest from the authorities. We barely had time to do more than take the portraits, enjoy a quick cup of tea and a chat with everyone before having to head back to the market gate to catch the last line car back to Mae Sot. Luckily we were offered a lift from one of the Thai camp guards who was on his way into Mae Sot, so once again like before we climbed aboard saving an indefinite wait for a further line car that may not even turn up. Back in Mae Sot and we lined up one further shoot before calling it a day. I had met Daw Htay Htay Win during Thingyan and she was now available for a portrait so we met up at Aiya, moved a few photos around and tried to work with the failing light to get something to work. Daw Htay Htay Win was first jailed aged 15 during the U Thant uprising in 1974. She spent 3 years in prison… as a 7th standard student. She fled to Thailand in 2005 but returned to Burma in 2007 and participated in the Saffron Revolution. Once again she fled back to Thailand to evade arrest. 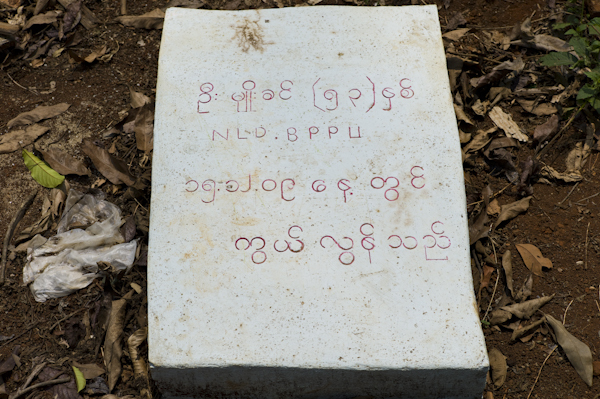 when Cyclone Nargis struck in May 2008 she once again returned to Burma to visit her fathers tomb in the Delta. On her return to Thailand she was caught in Myawaddy and sentenced to 2 years in prison under 13(1). For full details on the time spent in Nupo refugee camp please click HERE. Below is a short video documenting the former political prisoners photographed in the camp.